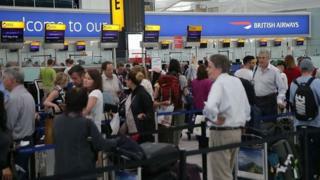 Hundreds of passengers flying out of Heathrow did so without their luggage after the airport's baggage system failed. The problem affected British Airways, Iberia, and American Airlines flights earlier in Terminal 3 and Terminal 5. It said passengers forced to travel without their luggage should contact their airline to find out when it would be returned to them. Although flights were able to operate as normal, it is understood that hundreds of passengers departed without their bags. People were advised to pack essential items in their hand luggage. It comes three weeks after an IT system failure caused chaos for thousands of British Airways passengers. A spokesman for the airport told the BBC hold bags will follow passengers but they could not say when. Heathrow posted a message on Twitter at 06:45am BST to alert passengers of the issue. An updated statement was issued at 09:07am to report that bag drop desks had reopened.